I was born in London in 1958. I can't remember a time when mountains were not a big part of my life. 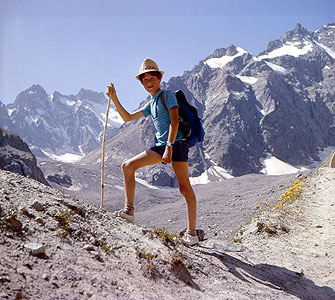 This is me on my 11th birthday on the Pelvoux glacier near Ailefroide in the French Alps. Between 1984 and 2003 I spent an average of 9 months each year in the Himalaya, and during that time began guiding and writing for various outdoor, travel and geographical publications. I also made a lot of wonderful friends. Since 2004 my wanderings have been a little more sporadic due to housebuilding and family commitments, but a large part of my heart will always be in the Himalaya. "In Search of Myths and Heroes". My photographs illustrate his book, published by BBC Worldwide, accompanying the series. I've always had a passion for photography and cannot imagine traveling without a camera. My Nikon FM2, F5 and Veronica the Bronica accompanied me every step of the way over countless passes. My rucsacs have never been light! I stepped resolutely into the digital age when I was first commissioned to shoot The Big Chill music festival in 2008. I definitely bonded with my Nikon D300, and in 2014added a D610 to my bag.